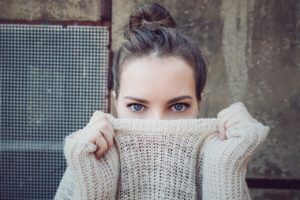 There’s no need to hide behind that sweater – there are better ways to protect your skin as the seasons change, and they won’t uproot your entire skin care regime, either! Protecting your skin from seasonal weather changes is an important part of your skin care routine. With each season, the air around us changes drastically, which can really harm our skin if we’re not taking care of it. As fall draws nearer and the air gets cooler and dryer, follow these tips to keep your skin looking fresh and radiant! Keep drinking lots of fluids. It seems simple, but people forget to drink water all the time! Even though we don’t have that summer heat anymore to remind us how thirsty we are, we still need to be drinking lots of water every day. So keep a water bottle nearby, and if you think of it, take a few sips here and there throughout the day. Replace your lotions with creams. A thicker moisturizer will keep your skin hydrated better and longer. Creams contain a strong, oily base, which provides an effective barrier to all that dry air. That being said, you should still keep in mind your personal skin type when choosing a moisturizer. See your Esthetician for tips on choosing the right moisturizer for your skin. Here’s another tip: invest in a small, travel-sized hand cream that fits easily in your purse so that you can moisturize your hands on the go! Give yourself an oil treatment! Try giving your skin a luxurious natural oil treatment! Although it may be counter-intuitive to rub oil on your face, using all-natural oils will lubricate the dried-up sebum on your face, which would otherwise be clogging your pores. It’s very important that you use natural oils, though. Choose something that’s vegetable or plant-based, like olive, coconut, or argan oil. Mineral Oil is derived from petroleum and can actually clog our pores, rather than clearing them. Don’t forget about sunscreen! Just because the sun isn’t as direct in the fall, that doesn’t mean that it’s not still blasting us with those harmful UV rays. The sun’s UV rays can cause some pretty serious conditions, including skin cancer. Out of sight does NOT mean out of mind, so be sure to wear sunscreen if you’re going to be outside for prolonged periods of time. Get plenty of rest. Most people don’t associate sleep with their skin care routines, but it’s actually a really important part of maintaining healthy skin. While this tip goes for all seasons, of course, it’s especially important in the fall/winter months when the air is harsher. According to WebMD, there are loads of benefits for your skin when you get your “beauty rest,” including a brighter complexion, less puffiness around the eyes, and a greater likelihood that your skin will take well to certain products. So be sure to take your bedtime seriously! Facials: Benefits of Facials: Why to Keep Coming Back! Skin Care for Every Season. American Society for Dermatologic Surgery. https://www.asds.net/_PublicResources.aspx?id=5770. Accessed 18 Sept. 2017. Dr. Jones, Carrie. 5 Ways to Protect your Skin from Fall Weather. Women’s Health and Wellness. http://www.empowher.com/skin-hair-amp-nails/content/5-ways-protect-your-skin-fall-weather. Accessed 18 Sept. 2017. Ma, Kristen. Six Ways to Autumn-Proof your Skin. Huffpost, 6 Sept. 2013. http://www.huffingtonpost.ca/kristen-ma/fall-skincare-tips_b_3761719.html. Accessed 18 Sept. 2017. Thompson, Jr., Dennis. 5 Ways to Protect your Skin. Everyday Health, 22 Mar. 2017. https://www.everydayhealth.com/skin-and-beauty/skin-care-101/protect-your-skin.aspx. Accessed 18 Sept. 2017. Bailey, Cynthia. Do You Need to Protect your Skin from the Sun in Fall and Winter? Dr. Cynthia Bailey Skin Care, 7 Dec. 2015. https://www.drbaileyskincare.com/info/blog/do-you-need-to-protect-your-skin-from-the-sun-in-fall-and-winter#.Wb_hsciGPIV. Accessed 18 Sept. 2017. Jacob, Stephanie. The Truth About Beauty Sleep. WebMD, 19 Nov. 2015. http://www.webmd.com/beauty/features/beauty-sleep#2. Accessed 18 Sept. 2017.